In my native the Netherlands, Saint Nicholas arrives by steamboat from Spain and distributes presents on December 5th while riding on a white horse over the rooftops. I have little trouble explaining the logic of all this to my American friends, especially when I point out that their “saint” arrives with quite less dignified means of transportation from the North Pole on Christmas (dec. 5 is st. Nicholas’ birthday) . Not to mention the elves. Jaws drop, however, when I mention that Saint Nicholas (sinterklaas) is helped by a number of black assistants all conveniently named Black Pete (zwarte piet). These assistants carry around big sacks in which they transport candy for the good kids but they also have tools for punishing the naughty who, legend has, may end up in Black Pete’s sack to be transported to Spain. Most of my American friends need no further proof of the backwardness of Dutch culture. How can a seemingly civilized nation indoctrinate small children with such stereotypes reminiscent of colonialism and the slave trade? Steven Colbert poked fun at it by citing it as a perfect example of “Christmas originalism” (about 1:40 in). Yet in the Netherlands, it hasn’t been all that controversial. 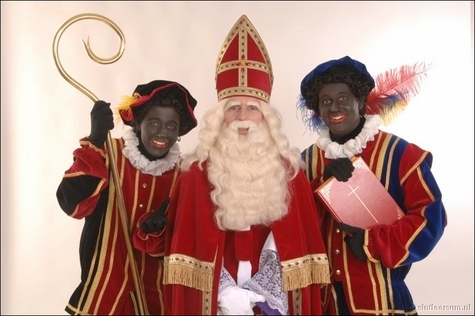 Sure, Black Pete has become a lot less silly and a lot smarter in sinterklaas stories. One racist line from a sinterklaas song was removed. The Dutch version of PBS once replaced Black Pete with a rainbow colored version but quickly returned to the old fashioned model. It just isn’t a big deal. On Facebook I can find a “Zwarte Piet must Stay!” group but no group that argues the opposite (the Facebook group mentions unspecified “others” who oppose Black Pete). I’ll let you guys decide whether this is definitive proof of backwardness or just evidence of a healthy laid back attitude . After all people are perfectly capable of developing racial prejudices without Black Pete. In the mean time, I am going to think about how to explain all this to my daughter, a little Dutch girl growing up in the U.S.
“Six to Eight Black Men” is one of David Sedaris’ funniest monologues. If you haven’t heard it, it is on his “Live at Carnegie Hall” CD. I just discovered this through watching a dutch rom-com Love is All (http://www.imdb.com/title/tt0468644/). You have here a great opportunity to break the cycle. Good luck on that. That David Sedaris story is great. If anyone is interested in learning more about Zwarte Piet, they should check out “>http://alturl.com/438v”> this story from NPR a few years ago. After all people are perfectly capable of developing racial prejudices without Black Pete. By that logic, any racial caricature — or for that matter, any bit of media, teaching, or social pressure toward racial prejudice — is just fine, since people could become prejudiced without that specific item. Stentor: of course you are right but this wasn’t meant as a justification but a reference to the general attitude the Dutch tend to have about these things: they just don’t think it matters all that much and hate to create fusses about this. The reaction against anything that even smells like “political correctness” tends to be very strong (e.g. Theo van Gogh). What percentage of the Dutch population is black / African descent? Maybe the reason they’re so “laid back” about it is that not many of them have ever been on the wrong end of a racial slur or stereotype. What’s with the “arrives by steamboat from Spain” angle? The Dutch revolted against Spanish rule only to have their St. Nicholas come from Spain?! ?